October is nationally recognized as Domestic Violence Awareness Month, and this year we’re inviting local businesses in Hampton Roads to participate in a unique way. Domestic violence is an issue that is so difficult to talk about, but so important to bring to light. The latest statistics from the World Health Organization show that 1 in 3 women and 1 in 4 men will be the victim of severe physical violence by an intimate partner in their lifetime. 41% of homicides that occur right here in Virginia are related to intimate partner violence. For the last 30 years, Samaritan House has been a leader in the movement to end domestic and sexual violence across Hampton Roads. We offer comprehensive support services and housing to men, women and children in need of safety and support. Last year, Samaritan House served over 4,000 individuals with housing, case management, children’s services, and education resources. Lolly’s Creamery and Soup Co.
Engineering and Testing Services, Inc.
We invite businesses in every industry to take a stand against domestic violence with us. There are so many different ways to get involved, and we would love to talk with you on how you can help Samaritan House #PAINT757PURPLE this October. Contact Eva at evaf@samaritanhouseva.org or 757-323-6164 to learn more! New in 2018! Paint 757 Purple Mural in ViBe Creative District! Artist Devon Miller finished painting her design on the wall of The Annex Collaborative Studio, Owned by Superior Pawn in the ViBe Creative District! Check it out! 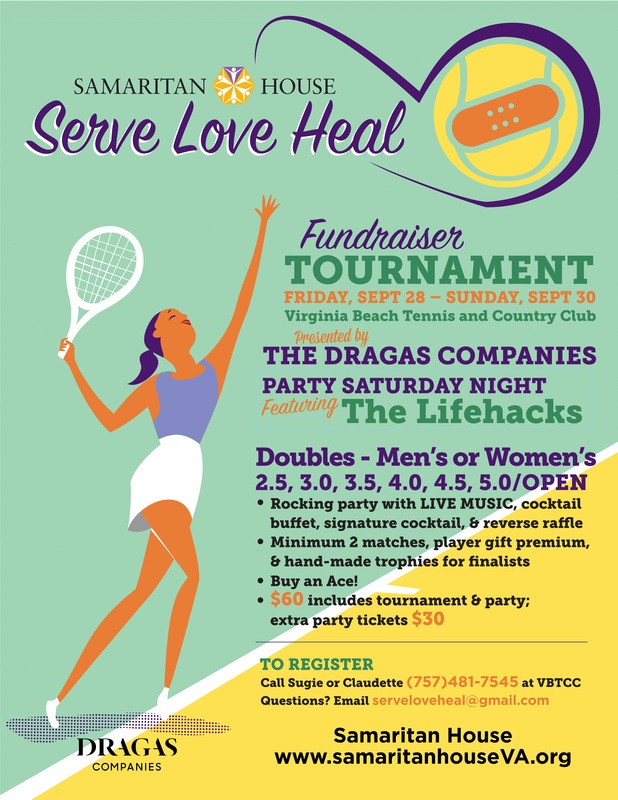 Thanks to The Dragas Companies and all our players for this year’s fun tournament! Any business can invite customers & patrons to make a small donation and sign a purple donation card to post around your establishment and show their support of Samaritan House’s work to end violence. Businesses can offer a signature purple item, where sales from a specific product or service will be donated to Samaritan House. The sky is the limit here: purple donuts, cocktails, streaks in hair (or for your pup) and accent nails, the way you Paint 757 Purple is up to you! Engage your coworkers, friends and family in an online fundraiser during the month of October. Reach out to us to get set up on the official campaign page, and talk with your company about seeing if they’re willing to match employee donations! Want to paint outside the box? That’s great! We’re here to help you come up with fun ideas to get your business and customers involved. Throughout the month, we will be featuring all participating local businesses on our website, social media, and newsletters. We will do regular business spotlight features throughout the month and provide each business with professional photos to be shared on social media – both ours and yours! There will be opportunities for appearances and mentions on various local news and entertainment outlets. Our team is happy to work with you to determine the best method of involvement in Paint 757 Purple for your particular business. Whether that means a percentage of sales for a particular service or product on a set day, week or throughout the entire month, your support is vital to helping us get the word out and give a voice to those who have suffered violence. Help us Paint 757 Purple!